This page assumes that you already purchased a license. If it is not the case go to the shop page and purchase a license or contact your reseller. Our networking licenses are distributed in a very usual way. We provide you a license server software (LM-X from x-formation), and a license file that contains a number of tokens that can be distributed in your local network. Each time a user launch one of our software product, a token is checked out, each time the software product is closed (or even crash), the token is released. If your license allow X tokens, then X clients will be able to run the software. Download and install the server software and its tools on your server machine using appropriate installer depending if you want to run the license server under windows, linux, or macOS. You should have a 12 hexadecimal lenght string that look like this one: 52H62B1BAH52 TIP: To get the server ethernet address, you may use the tool lmxconfigtool, which is is included into the LM-X End-user Tools package and present into the license server installation directory. Go to your account and use the “SET” button of the “HostID” field to set the ethernet MAC address of your license server machine. Then click the download button to get your license file. TIP: If you don’t see any floating license in your account it is because either you don’t have puchased any license yet, or because your reseller did not transfer your license yet to your account, or because you are logged using a wrong account. Simply copy the license file on your machine server’s harddisk. NOTE: DO NOT INSTALL THE LICENSE FILE ON THE CLIENT MACHINES. The license file must be installed on the server machine (see above). Don’t forget to set that variable for all users of the machine so that all of them can use the software. Please look at this page to see how to set up environment variable on MacOS. And this page for Windows. Please follow that link to get more information about the installer command line. Check that port 6200 is open on both direction and both on server and client machines for tcp and udp protocols. Notice: You can change the TCP port to another value than 6200. But the UDP must be the 6200. 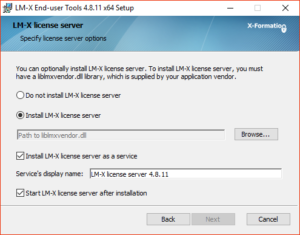 Please verify that you set the LMX_LICENSE_PATH correctly (have a look at section 8). 1. Check that your license server is running. 2. Check the log of your license server. See at the end if feature “Save” and “Info” are available. If they aren’t, you may have an incorrect license file. Can the server be installed on other networks or even on the internet? Yes, providing that no firewall block communication of the port 6200 and a valid route exist between the license server and the clients machines.